ELS Goes Behind the Scenes of Game Night! 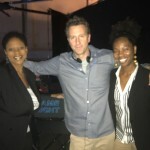 ELS Partner, Chandra Davis, and attorney, Raquel Crump, had the pleasure of visiting the movie set of Game Night, which stars Jason Bateman and Rachel McAdams. Jonathan Goldstein, ELS client, is the director and writer of the movie. Thanks Jonathan for allowing us to get a sneak peek!